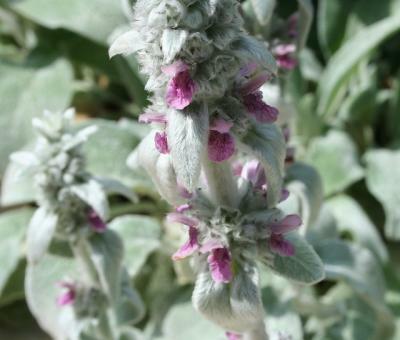 Lamb's ear (Stachys byzantina) is a perennially popular garden plant, grown primarily for its felty grey foliage. 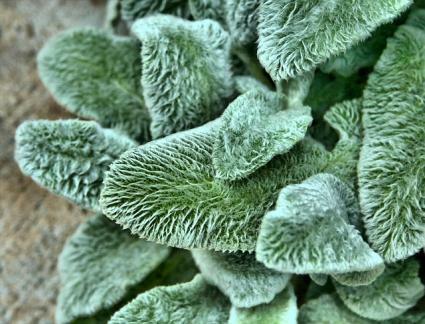 The leaves have an exquisitely soft texture, but lamb's ear is a tough-as-nails groundcover for the garden. 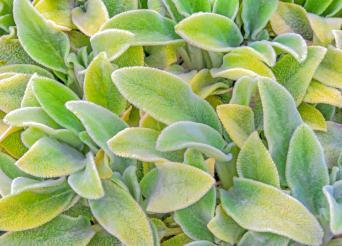 Lamb's ear spreads quickly to become a six-inch carpet of soft grey-green foliage. The flowers rise 12 to 18 inches above the foliage in summer as tiny clusters of purple blossoms that are all but obscured by the covering of felty grey hairs around them. However, it is known more for its elongated oval leaves than it flowers. It is hardy in USDA zones 3-9. 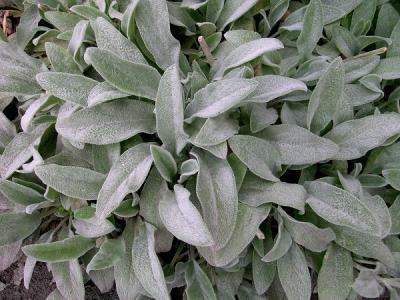 Full sun is the main requirement for lamb's ear; it can tolerate partial shade in extremely hot places, but the foliage loses some of its characteristic grey color in the shade. It is fairly drought tolerant once established and will adapt to almost any soil type as long as drainage is good. Lamb's ear is the ultimate edging plant. Use it along paths, walls and driveways to soften the edge of hard, straight lines. Or, use it as edging around beds of perennial flowers - it forms a static, attractive frame for more colorful species that come and go throughout the growing season. It can also be used as a large scale groundcover, as it forms a thick mat of grey foliage, making a pleasing contrast around taller green-leafed plants. Lamb's ear is available in most garden centers and can be planted in spring or fall. It doesn't need a rich planting bed; simply stick the plants in the ground about 12 to 18 inches apart anywhere with sufficient sun exposure and good drainage. Water lamb's ear weekly to get it established, but afterwards it only needs water every few weeks to keep it happy in all but the hottest, driest climates. Individual plants will quickly spread to about 18 inches in width and then slowly spread out from there. Every few years you can divide the clump to keep it contained in the space allotted for it and to provide new plants for other locations in the garden. While lamb's ear isn't invasive in the sense that is will pop-up away from where it is planted, it does spread to cover a large area eventually if its growth is not curbed. Lamb's ear is fairly easy to eradicate where it's not wanted, however. The only other maintenance is to clip off the dead flower stalks as they fade toward the end of summer. Other than the fungal diseases that occur with lamb's ear in excessively hot, damp conditions or where drainage is poor - such as leaf rot and powdery mildew - lamb's ear is not bothered by pests or disease. Dividing crowded plants and removing the mats of dead leaves that form around the base of the plants helps to provide better air flow and limit the impact of these pathogens. There are a few cultivars of lamb's ear that may be encountered in nurseries. 'Big Ears' has especially large foliage and is more tolerant of humidity than other varieties. 'Silver Carpet' has smaller than average leaves with a bright silver-grey color and does not flower. 'Primrose Heron' has variegated yellow and green foliage. 'Cotton Boll' has extra fluffy flower heads that look like little balls of cotton. Children always love to experience the soft foliage of lamb's ear, which is quite similar to fuzzy fur that covers the ears of many small animals. It is very effective at outcompeting weeds and is one of the easiest perennials to grow, holding its own in the garden for many years.